15 months ago, the World ARC 2016-17 fleet set out from Saint Lucia to sail around the world. Amongst the crews were many nationalities, backgrounds and reasons for taking part. 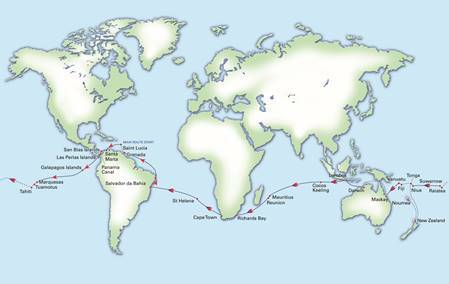 Since then, they have sailed well over 26,000 nautical miles, crossed 3 oceans and visited more than 17 countries. As they arrived back in Saint Lucia, they have joined the special band of circumnavigators who have sailed the world on their own boats, and, perhaps more importantly, become a family bonded together by hundreds of shared experiences to last a lifetime of reflection. 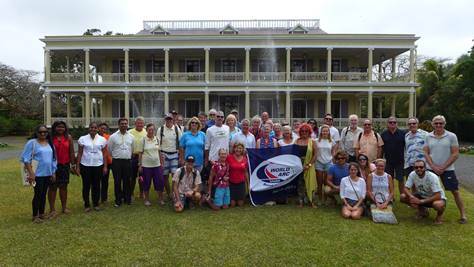 This edition of the rally, the sixth World ARC organised by World Cruising Club, saw 35 people complete their round the world adventure; 23 have achieved this in one edition of the rally, whilst others have taken time out along the way, exploring further afield, assisting with charity relief projects and taking a break to fly home. The fleet has evolved over the months and in total almost 300 people have taken part on board 44 boats, aged from 6 years old up to 82. Crews have represented 26 different nationalities forming a 'floating United Nations' at each stopover, sharing their own cultures with those countries that have hosted them. The final day of this voyage was always going to be one of mixed emotion; pleasure and pride at the achievement, but also sadness for the end of the adventure. The Parade of Sail and official prize giving ceremony provided a fitting finish and the sight of the fleet parading up the coast of Saint Lucia accompanied by members of the Saint Lucia Yacht Club, media and supporters of World ARC in Saint Lucia was an emotional moment for many. 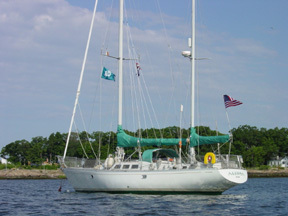 A light breeze made for a motor in an orderly fashion with one yacht behind another in reverse order of length overall. On their circuit of Castries Harbour steel pan music wafted across the harbour from a band on the wharf, which helped keep crews in party mode as they moved to the sounds on passing by. Crossing the finish line, that had been their start line fifteen months before, marked an end to the circumnavigation with World ARC as they were each personally congratulated by Andrew Bishop, Managing Director of World Cruising Club. "Completing a circumnavigation is a very special moment, and to be here to welcome and congratulate our World ARC participants is always a great experience, especially with a group that has bonded so closely." On the Gros Islet cut into Rodney Bay Marina a group of twenty or so school children were joined by the Minster for Tourism, Dominic Fedee, all waving to welcome the yachts back to Saint Lucia, a gesture much appreciated by all the participants, and thanked for later by Jukka Auramo from Mearra Nieida at the prizegiving. The Saint Lucia Tourist Board hosted a fantastic prize giving dinner in the evening at the Royal by Rex Resorts Hotel, where crews were welcomed back to Saint Lucia by the Honourable Dominic Fedee, Minister for Tourism, Heritage and Culture in Saint Lucia, who said how pleased he was to see World ARC's return to the country's shores. The evening of celebration continued with superb food, and after-dinner dancing late into the night which was a splendid way to end 15 months of challenge, excitement and fun. The crews have been spoilt with some beautiful, fascinating and welcoming places all around the globe but speaking on the dockside, all agreed that it will be their friends from the rally that they will miss most as they go their separate ways. "We will miss the people we have met on this incredible journey and those with whom we have shared so many amazing experiences, and the excitement of visiting remote places." Said Pat and Stuart Smith from Discovery 55, Brizo. Jukka Auramo, of Finnish flagged yacht Mearra Nieida reflected that, "Sailing round the world with World ARC has been like sailing around the world with family." Exploring the world together as a 'World ARC family' has made all those experiences into truly special memories to be treasured for years to come. Demand continues to be strong for World Cruising Club's annual round the world rally. 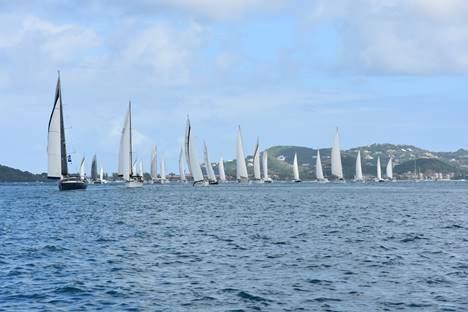 26 boats left Saint Lucia's shores in January as part of the World ARC 2017, and have since visited Colombia and the San Blas Island, transited the Panama Canal and crossed the Pacific Ocean. Arriving in Hiva Oa after almost three weeks at sea the crews have been enchanted by their time so far in French Polynesia. "We loved the Marquesas Islands." Said the crew of Laura Dawn. "It's just an incredible place; from snorkelling off the headland in Hiva Oa where we saw a huge Manta Ray, trekking through the rain forest to the waterfall in Nuku Hiva, hiking the ridge collecting fresh fruit on the way in Tahuata, and the incredible welcome that the local people have given us both formally and informally around the islands. It's been an amazing experience." World ARC 2018 currently has a record entry list of 40 boats due to start their adventure from Saint Lucia in January 2018, and a new ARC Pacific fleet will set out from the US west coast to join them in French Polynesia. 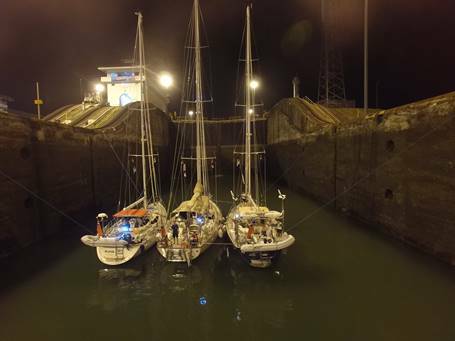 Entries are now open for the 2019 edition of World ARC and future circumnavigators looking to fulfill the ultimate bucket-list dream are encouraged to start planning now for their own adventures. For more information about future editions of World ARC, visit www.worldcruising.com/worldarc.